Right at the start, it may be necessary to confess that I have a nail polish addiction (on top of already having a make-up obsession. I paint my nails far too often, largely because I get bored with colours easily. Gel on my fingernails never seems to last long either, but I adore the gel look. Cue Essence’s THE GEL Nail Polish. Shiny. I got distracted by the shiny Top Coat bottle and the silver writing on the nail polishes. A cute, girly design, these little polishes are perfectly sized, although there is no real packaging as such. To pull off the Gel Look, you need (1) Essence The Gel Base Coat (2) Essence The Gel Nail Polish of your choice (have I mentioned that they seem to have a million colours?) and (3) Essence The Gel Top Coat. I’m also a fan of Essence Express Dry Spray. It’s so simple! For gel-like nails, simple paint the base coat, let it dry, follow with the nail polish colour and then finish off with the top coat (and a spray of Express Dry Spray if you are impatient like me). I actually had to go and double check the price when writing this up as I did not believe my notes! Each of the Essence The Gel Base Coat and the Essence The Gel Top Coat retail for around R44.95 (you can get them at Dischem here) and the nail polishes are available for an unbelievable R22.95 each (check it out for yourself here). 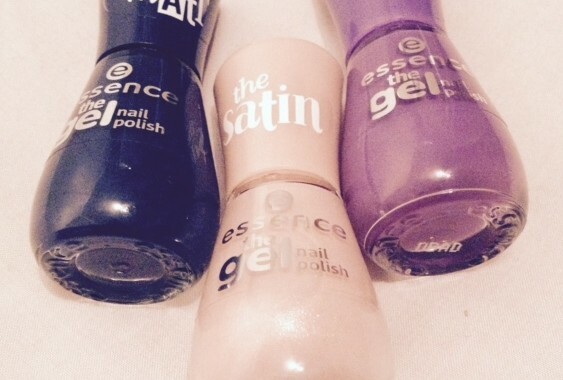 Fool your friends into thinking you’ve had a gel mani or pedi with these great products! The only downside is that I noticed the polish peeled off quite (day 2 or 3). I’ve found this to be a problem when using drying sprays or drying drops in the past so I don’t think it is necessarily an issue with the Essence The Gel range, but in any event, for someone like me who likes to change up their nail polish all the time, this actually suits me quite perfectly! Nail colours in my pic are : Essence The Gel Satin Nail Polish 35 Engaged (the light pink), Essence The Gel Nail Polish 20 Beautiful Lies (purple) and Essence The Gel Matt Nail Polish 22 I ♥ my blue jeans (denim colour). Posted in Spa Product Reviews and tagged beauty, beautyblog, Hands and Feet, nailpolish.